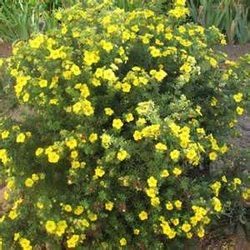 Goldfinger Potentilla is a compact Potentilla that has golden yellow flowers which blooms all summer. Potentillas make excellent foundation plantings, plantings around a deck or patio, hedges, or shrub borders. Goldfinger Potentilla would be a good choice for a moon garden. Its leaves are bluish-green which turn yellow in the fall. Goldfinger Potentilla likes to be planted in full sun. It grows to a height of 3' and 3' to 4' wide. Goldfinger Potentilla is a great choice for attracting butterflies and bees. It is drought tolerant once it is established. It is deer resistant and is also a Firewise plant.